The automaker has issued a formal apology, but claims it was not responsible for the casting announcement. Acura has issued an apology for Wednesday’s release of a casting document calling for an African-American actor that was “not too dark” for the automaker’s Super Bowl commercial. The divisive casting announcement was published yesterday by TMZ. The celebrity gossip site obtained the document from a disgruntled African-American actor who evidently did not fit the bill due to his darker complexion. 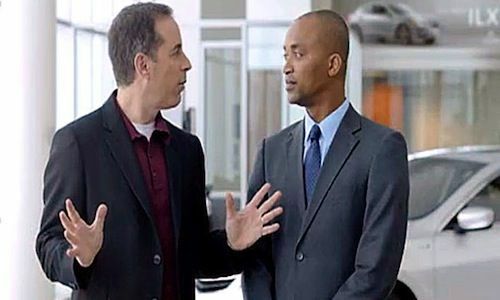 The role in question was for an “African-American Car Dealer” who was responsible for telling Jerry Seinfeld that he was second in line to receive the all-new Acura NSX sports car. The characters full description reads: "Nice Looking, friendly. Not too dark. Will work with a MAJOR COMEDIAN." As might be expected, the “not too dark” specification outraged many, forcing Acura to address the issue. Although some in the media as well as public are denouncing Acura, the car company is contending that it was unaware of the casting description. Acura spokesman Gary Robinson told CNN, “Any of the creative directions didn't come from Acura. They would've come from the casting agency." Acura also issued a statement that read: "We apologize to anyone offended by the language on the casting sheet used in the selection of actors for one of our commercials. We sought to cast an African-American in a prominent role in the commercial, and we made our selection based on the fact that he was the most talented actor." Although Acura claims it was not responsible for the content of the casting announcement, it did state that it was "taking appropriate measures to ensure that such language is not used again in association with any work performed on behalf of our brand." Cathi Carlton Casting, the agency behind Acura’s Super Bowl ad has yet to weigh in the matter. The firm, which is based in Santa Monica, California, is currently choosing to defer to Acura’s statement. The 2012 Acura NSX concept depicted in the Super Bowl spot was unveiled in January at the 2012 North American Auto Show held in Detroit, Michigan. The upcoming sports car features a coupe design, all-wheel drive, V6 engine and three electric motors. Acura is set to start production on the NSX in 2015 at the Marysville Auto Plant in Marysville, Ohio. Related article: Acura NSX Super Bowl ad sought African-American actor that was "not too dark"
What people seem to be overlooking is the segment with the sales rep in the dealership had no special effects. What lighting challenges were presented in this scene? Before his tax evasion issues, Wesley Snipes, a dark-skinned actor, did a lot of movies with lighting and special effects. This casting agency was casting against Seinfeld and not for technical reasons.